DALLAS, Sept. 4, 2018 — Prospera Financial Services, Inc. (Prospera) was named as Investment Advisor magazine’s 2018 Broker-Dealer of the Year in Division I, representing firms with up to 199 producing advisors. The magazine conducts an annual poll asking its financial advisor readers to anonymously rank their firms on criteria like service, payout, and technology. This is the sixth time in ten years that Prospera has attained the prestigious industry honor, and was previously honored in 2009, 2010, 2012, 2014, and 2015. David Stringer, President of Prospera, states, “This award is especially meaningful to me and the entire Prospera team because it came from our reps through their votes. We’ve believed since day one that our highest purpose as a firm is to deliver our unique brand of true independence within the framework of gold standard service. This win certainly feels good and reinforces that we are on the right track as we continually raise our standards and aspire to be the gold standard for boutique independent firms. 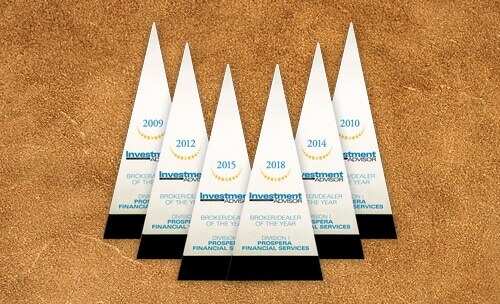 The annual Broker-Dealer of the Year award is based on voting in 15 different categories. The broker-dealer receiving the highest average rating from its voting representatives wins Broker-Dealer of the Year in its division. Investment Advisor, a publication of Summit Business Media, offers information and analysis on wealth management, retirement planning, investment strategies, practice management, compliance and regulatory issues, and insurance and tax planning, all designed to help registered investment advisors and independent broker-dealer representatives become more successful. Since 1991, the editors of Investment Advisor have invited their readers, who are producing, independent contractor representatives of Broker/Dealers to rate their own Broker/Dealers in a number of categories and provide an overall rating.